Thanks to Diabetic Danica for the term. Angelina got sick a week ago. Nothing major just a cold. Yeah, right. Every illness seems to be major when you have T1D. She woke up last Thursday complaining of congestion and had a very low grade fever, but it was only a half day and she had her endocrinologist appointment anyway so I kept her home from school. She just kind of hung out with me in my bedroom all day as we are having workers replace all our pipes and I have been sort of barricaded off in my bedroom while they are in and out of the house. Blood sugars were okay up until it was time to go to the endo and then, of course, she was high. The endo appointment went long because I was going off about what has been going on with her school and that subject is something that just sets me off lately. On the bright side, endo has agreed to attend a meeting at her school so we can get everything squared away and the endo can write orders that meet everyone’s needs, and the school nurses needs for everything to be phrased just so. A1c result was lower than I was expecting since we have seen quite a few overnight highs lately – down to 7.2 from a 7.8 in November. Turns out the overnight highs that I was attributing to growth spurt/hormones/delayed highs from dinner was really that her midnight basal rate was MUCH lower than her evening basal rate, and I never really noticed since her settings report (and trend lines) are all linear starting at midnight and running to midnight without looping back around. So, I didn’t notice that midnight setting was so much very lower than the evening setting before it. Dr also tweaked her carb ratios a bit and jumped her daytime ISF from 100 down to 75 (!). I can’t really tell how well any of it is working yet though because with illness (even minor ones) comes the need for much more insulin and/or lots of highs, and then possibly lows and yo-yoing blood sugars from trying to figure out just how much extra insulin she is going to need at any given point during the day or night while she is sick. The last time she had a cold she was still in honeymoon and we saw her insulin need increase by about 50%. She was not on a CGM at the time so I didn’t feel really comfortable being more aggressive than that as I was afraid of her going low, especially at night. Since she is on the Dexcom now (which is amazing, btw!) I can see what her blood sugar is doing every 5 minutes so I felt free to increase her insulin to my heart’s content and was able to get her into her target range for a good portion of the day. I started her out with the 50% increase, but she was still up in the 300’s, so we went to 75% increase- still high. 100% increase (so twice as much insulin as usual) and still not able to get her below approximately 225. Since the temp basal program on her pump only goes up to a maximum of 100% increase (or 200% of normal) I had to program in a whole new basal program for her. To be safe, I programmed it at about a 50% increase and then did an additional temp basal on top of that. About 70% extra at home, and a 20-30% increase when she finally went back to school on Tuesday. Well, the problem with this is that a temp basal can only be set for a maximum of 24 hours and it doesn’t give an alert or anything when it’s finished. On Tuesday night I forgot to reset it for the higher amount before bed so I got woken up at midnight to a “HIGH 300 mg/dL” on the Dexcom. It was at that point that I realized I had forgotten to reset the temp basal. So I did correction, set the 70% increased temp basal and went back to bed and figured the Dexcom would wake me up if there was a problem. No alarms during the night, and at one point I woke up and her blood sugar was hovering around 175 and I though “Great! She came down nicely. 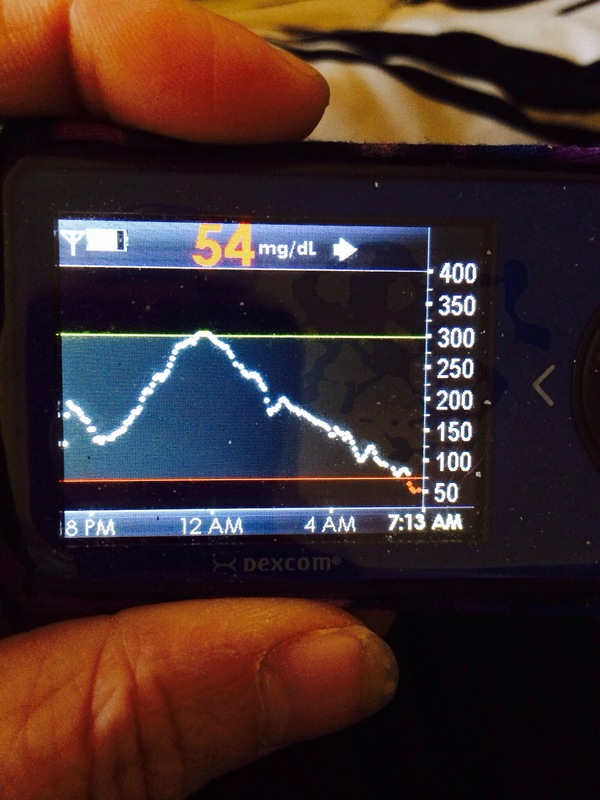 The correction should have finished by now so we should see an in range number first thing in the morning.” And then around 6:45am, shortly after David had left for work I woke up out of a sound sleep and grabbed the Dexcom. It said she was 87! Now, 87 is a little below range for her, but still a perfectly acceptable number. It was just a little surprising to see her blood sugar had continued it’s downward trend so many hours later still. I got up to go check her blood sugar and meter says 60. Okay, well, that’s a bit unexpected. I try waking her up and she just kind of pulls the blanket tighter. So I grab juice since it’s the easiest thing to try to get a sleeping child to swallow. It took a little coaxing but she finally drinks the entire juice box and we settle in to wait. Keeping an eye on the Dexcom I’m starting to get a little concerned because it’s going down instead of up. I have seen the Dexcom have some trouble coming up from low readings to I am just hoping that it’s that. But, after the 20 minute wait I check her BG again and it is now down to 53, 1 point off of the 54 that Dex is reporting. Well, it seems the juice didn’t work so well… She’s still sleeping but maybe I can get her to chew a few glucose tabs. I grabbed another juice box, just in case, but tried to wake her again. I ask her if she will chew a glucose tab and she nods so I put it in her mouth and she makes an initial chewing motion, but then nothing. When I tell her to chew she just looks kind of bewildered so I say “Okay, let’s try more juice.” and have her spit the unchewed glucose tab into my hand. Waiting game is on again and I start to see the Dexcom finally creeping up…72, 83, 96. Yay! It seems we’re in the clear. Finger stick reads 124, and Dexcom is only a few points behind. Of course now it is actually time to get up for school. We go through the usual “I don’t want to wear that. Why aren’t XYZ pants clean? (maybe because mom isn’t a mind reader and didn’t know you wanted to wear them today?) I don’t know what I want for breakfast”, etc. And then she says “Why do I feel so terrible? I have a headache and I feel sick to my stomach.” I said, “Well, you were low. You just had 2 juice boxes and you probably need to eat something.” She just blankly stares at me and says “I was low?” She then notices the glucose tab, in pieces, sitting on the entertainment center and says “What’s that?” To which I reply “That’s the glucose tab you wouldn’t chew.” She had absolutely no recollection of being low, or drinking juice, or not chewing the glucose tab, even though this had all happened just 30 minutes before. She says “I feel terrible. Can I have ibuprofen? Is this what a hangover feels like?” And, thanks to Diabetic Danica, I replied “You’ve got a hang low-ver”. I don’t know what it feels like to experience hypoglycemia in the way Angelina does. I’ve had a handful of hangovers in my life (usually from wine), and I can’t help but feel incredibly sad that at 10 years old my daughter knows what that feels like, and not from alcohol. Her blood sugar levels were amazingly in range the rest of the day, except for another brief excursion into the upper 60’s after lunch, which then resolved itself (she didn’t even notice it until I said something after reviewing her Dexcom when she got home from school). So, for now, I have discontinued the extra temp basal, but she is still on the basal profile that is giving her 50% more insulin than usual. Today she is on a field trip. I am hoping that everything goes smoothly and she has a great time. Next week: school meeting with the principal, district nurse and the endo. Information on this page is our own personal experience. I am not a medical professional, please do not take any information from this page as medical advice. Please consult with your or your child's physician before making any changes. All information and media on this page is the personal property and © Jessica Grim unless otherwise specified. If you would like to share information from my site, please include a link to my blog or the specific post.